The two firms are reported to have signed a memorandum of understanding (MoU) on long-term lithiumsupplies for battery cells. Commenting on this report, Dr. Stefan Sommer, Group Board Member for Components and Procurement at Volkswagen Aktiengesellschaft said, “Over the next ten years the Volkswagen Group will be launching 70-plus new pure electric vehicles. “That means approximately a quarter of the vehicles we deliver in 2025 will be powered by electricity. “Consequently, there will be a rapid increase in our raw material demand for cell production in the coming years, and we must make sure we cover this demand at an early stage. While talks of an ‘offensive’ sounds like Volkswagen is preparing to go into battle, the fact of the matter is there is going to be a rush on commodities and components required for the manufacture of electric cars. This is going to occur sooner rather than later, and manufacturers who are slow off the blocks will be paying more in an environment where demand is increasing and supply is contracting. AFP noted the harsh European Union emissions limits set to bite from next year and toughen further by 2030, just another catalyst that will drive growth in electric vehicles across all manufacturers. AFP said that the new electric offensive is pushing the limits of battery production,music to the ears of explorers and producers in the lithium space given they have had to contend with commodity price headwinds over the last 12 months. Lithium demand isn’t just being driven by manufacturers of electric vehicles, high-volume commodity items such as smart phones and other electronic gadgets will also account for a significant proportion of global production. Each smart phone battery contains 3 grams of lithium, a laptop around 30 grams and an electric car battery more than 20 kilograms. However, electric vehicles remain the big ticket item, and on this front there was further positive news to accompany Volkswagen’s announcement. 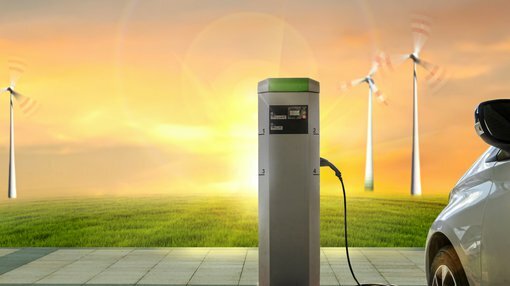 It was reported by Clean Technica on Thursday that Swiss startup Innolith AG, has developed the world’s first 1000 Wh/kg (watts per hour/kilograms) rechargeable battery. Under development in the company’s German laboratory, the new Innolith Energy Battery would be capable of powering an Electric Vehicle (EV) for over 1000 kilometres on a single charge. Importantly, Innolith’s new technology claims to have replaced the organic and highly flammable solvents used in lithium-ion batteries with inorganic substances that are more stable and less flammable. In explaining how the new technology works, Innolith co-founder Alan Greenshields said, “We take the organic materials out and replace them with inorganic or basically salt-like materials, and that does two things for you. “One is it gets rid of your fire risk, so, of course, there’s nothing to burn. In terms of what this is likely to mean for electric vehicle demand, Innolith chief executive Sergey Buchin, hit the nail on the head in saying, “Consumers want an adequate range on a single charge in an affordable EV, and confidence that it is not going to catch fire. 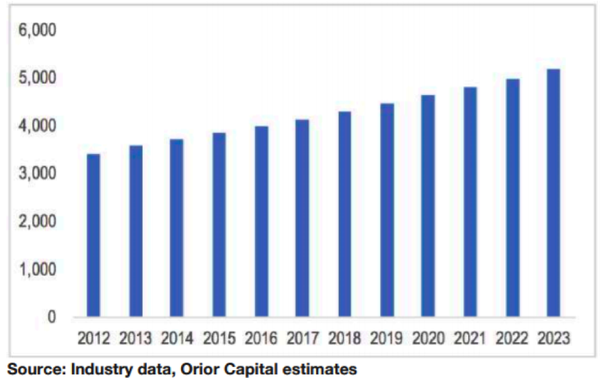 Guaranteed safety, along with improved performance and convenience is likely to accelerate the transition to electric vehicles, effectively increasing demand for lithium, and also potentially bringing forward the frenzy of activity as those EV manufacturers caught short look to secure sufficient supplies of the commodity to meet their needs. Australia has quite a number of lithium producers and explorers with operations at home and overseas. Some of the better-known ones are Pilbara Minerals Ltd (ASX: PLS), Galaxy Resources (ASX:GXY) and Altura Mining Ltd (ASX:AJM). Analysts at Macquarie ran the ruler across these stocks in January, and at that stage Pilbara Minerals had recently negotiated an agreement with Ganfeng, supplier to Volkswagen as indicated in the aforementioned MoU. The agreement entailed supply of 50,000 tonnes per annum of 6% spodumene concentrate from Pilbara’s stage III expansion. The group also entered into a non-binding MoU with POSCO to lift the proposed downstream chemical processing facilities capacity by an additional 75,000 tonnes per annum of 6% spodumene concentrate feed. Initiatives such as these aren’t going to be undertaken unless the margin between the cost of production and the selling price is attractive. It could be argued that this is the key metric that should be monitored rather than volatile commodity price movements. At the time of review, Macquarie upgraded Galaxy Resources from neutral to outperform, while maintaining its outperform recommendation on Pilbara Minerals. The broker attributed an underperform recommendation to Altura Mining. Macquarie provided some interesting commentary on Galaxy, which is pertinent for the neighbouring Galan Lithium Ltd (ASX:GLN), a company that has had recent exploration success in areas in close proximity to the former’s Sal de Vida project. Commenting on Sal de Vida, Macquarie said, “Following a recent update from GXY on Sal de Vida we have taken a longer-dated view of the asset. “GXY has received multiple bids from prospective partners with GXY extending the evaluation timeline. 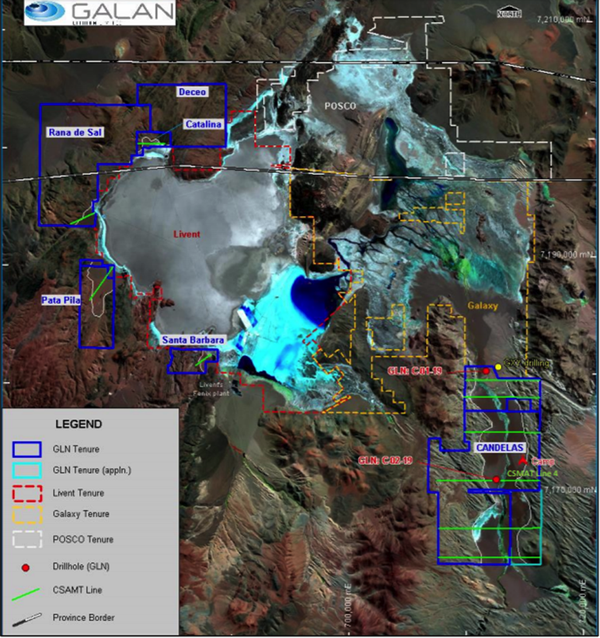 The fact that it is receiving interest from multiple parties is encouraging for an emerging player such as Galan, particularly given the group’s early drilling success as it lays the foundations for fast tracking a lithium carbonate production project in South America’s lithium triangle. On April 4, Galan confirmed field measurements indicated that the upper levels of a brine bearing aquifer had been encountered in the third drillhole from depths of approximately 280 metres to the current depth of approximately 310 metres. This is particularly significant given that the drillhole is approximately 2.5 kilometres south-east of the maiden drillhole which provided outstanding results including an intercept of 192 metres at 802 mg/l lithium with low impurities. American Pacific Borate and Lithium (ASX:ABR) is another highflying emerging player in the lithium space. In late-January the company announced enhancements to its Canadian-based Fort Cady definitive feasibility study (DFS) which included a low capital expenditure starter project that works on a standalone basis. This effectively reduced pre-production capex to US$36.8 million, providing a pathway to Phase Three that has an annual EBITDA in the first full year of production of over US$340 million. 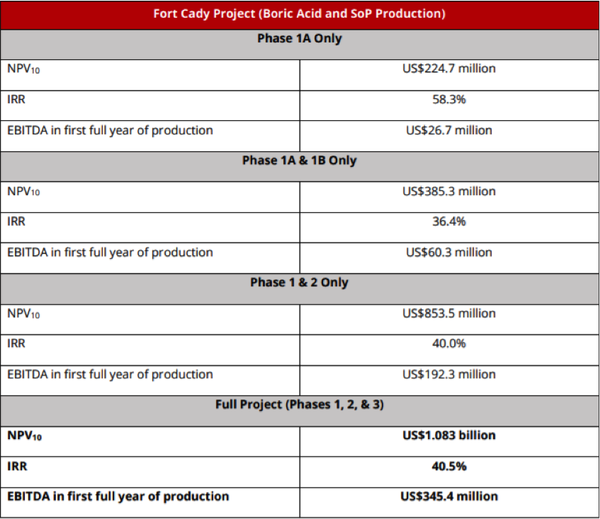 It has also made the Fort Cady Project easier to finance, whilst limiting likely share dilution and preserving a massive EBITDA target in full production. This is a significant development for a smaller company given raising capital is one of the most difficult hurdles to overcome, particularly without diminishing its stake in the project or issuing new capital which substantially dilutes earnings. Recent developments have seen the company’s shares nearly double since December, but former Macquarie and HSBC resources analyst, Simon Francis, believes there is substantial share price upside to come. He has identified the company as a potential ten-bagger on the back of its impressive DFS. Francis’ ten-bagger projection implied a share price of $1.60 when he made the call. 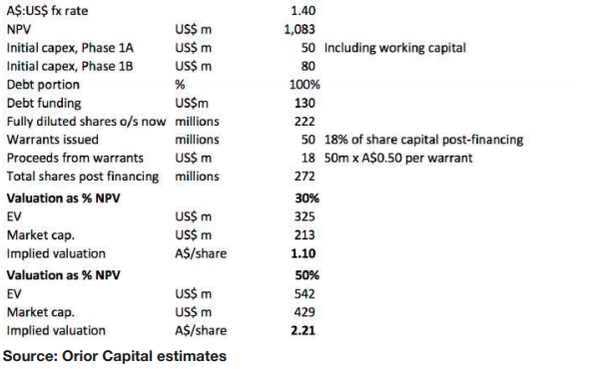 Putting this in enterprise value (EV) terms, Francis crunched the numbers on a mix of financing scenarios, projecting that ABR could attract an EV in a range between US$325 million and US$542 million within 12 months. This would equate to a valuation of between $1.10 and $2.21 per share, representing multiples of between 6.9 and 13.8 relative to a share price of 16 cents. The following is a valuation based on the January 2019 DFS base case. While being able to boast a US$1 billion project is headline-grabbing in its own right, arguably one of ABR’s most compelling investment metrics is its relatively near-term production outlook. In many cases, large-scale projects involve long lead times, but ABR expects first production from Phase 1A to occur in the December quarter of 2020. Francis noted that ABR will become only the second major producer of calcium-based borates globally, and only the second producer of salt of potash SOP in the US. Also working in ABR’s favour is the fact that few new projects are in the pipeline, and the borates market is essentially a duopoly with Turkish state-owned Eti Maden and Rio Tinto (ASX:RIO) controlling 80% of global demand. Boron and borates are used in many modern applications from abrasives to water treatment, and from soap to nuclear power plants, as well as being a product of need for emerging new age technologies such as devices requiring lithium-ion batteries and hydrogen fuel cells. The global market for boric acid (H3BO3) reached 3.9 billion tonnes in 2017, with the market expected to continue growing at approximately 4% per annum. Borates demand is being driven by the ‘big picture’ trends of urbanisation, energy efficiency, and food security. To put the value of the borates market into perspective, Francis said that it is about the same size as the US$3 billion lithium market.